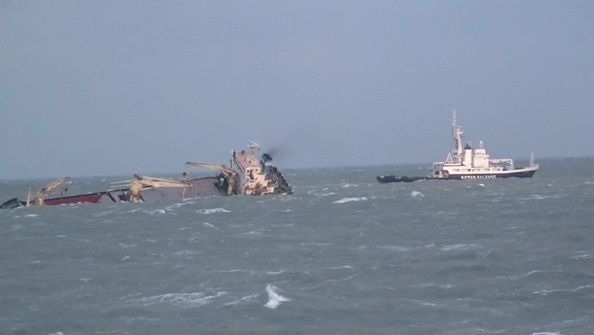 The general cargo ship Hung Thai 17 capsized in South China Sea on about 1 nautical mile off Vinh Son coast in Quang Dong, Vietnam. The vessel lost propulsion power after engine failure and remained adrift near the coast. The heavy seas and big swell caused cargo shift, which significantly reduced stability and capsized the vessel, remaining partially above the water. The crew succeeded to abandoned the vessel into a life raft and sent distress signal to the local authorities, requesting immediate evacuation. At the scene were dispatched rescue boats and all the 10 seamen were picked up on board without serious injuries. The situation around capsizing is unclear and local authorities started investigation for the root cause of the accident. There is no report about oil leak and water pollution, but area around the capsized general cargo ship Hung Thai 17 in under monitoring. The salvage and wreck removal will be arranged at further stage. The general cargo ship Hung Thai 17 (IMO: 9608647) has overall length of 79.00 m, beam of 12.60 m and maximum draft of 3.50 m. The deadweight of the ship is 2,950 DWT and the gross tonnage is 1,599 GRT. The ship was built in 2013 and operate under the flag of Vietnam. 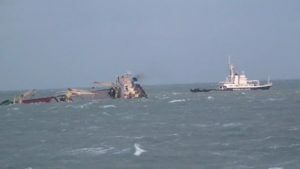 The owner and manager of the capsized ship is Vietnamese company Hung Thai Transport Co Ltd. During the accident the ship was loaded with apatite.